Ask fellow campers about "Pecan Park Riverside RV " and nearby attractions. Worst place ever, Owner & Manager are not friendly, beware. Electric has bad issues due to River flooding campground causing electricity problems. We camped at Pecan Park Riverside RV in a Travel Trailer. Getting a late start to Rockport, TX, we found ourselves scheduled to be on the road on Thanksgiving day. I did some searching and found this park. The pictures looked OK. I assumed that if I was paying $60.00 per day, it would be a nice place. Wrong. This park is bad. If I had paid in the normal range of around $30.00, I would have been fine. This park is substandard. When we drove by and then into the entrance, I was shocked. Then the office was closed for lunch. When the office opened, I went into seek a refund. The young lady said she could not offer a refund, but would tell the owner. I have heard nothing from the owner. I should have known something was wrong when I had to pay the entire balance of the stay up front ($240.00), plus the policy of NO REFUNDS. Last night, there was a pretty serious (wife says threatening) argument that could be heard from within our motorhome. We kept our porch light on all night. I have stayed at worse places, but the fee was around $25.00 or was another type of park and I expected nothing. My complaint is paying $60.00 for a trailer park. Now I know why the entire amount must be paid in advance. Most people would leave when they saw what they were driving into and not stay even one night! My recommendation is to avoid this park. I could go on and on, but tired of thinking about it. If it were not for it being level and full hookups, our Thanksgiving would have been ruined. We made the best of it. We camped at Pecan Park Riverside RV in a Motorhome. We are proud of our park: its cleanliness, peaceful atmosphere, family-friendliness, and gorgeous location right on San Marcos River. When you came into our office to tell us our park was not pretty (in front of other guests), you weren't able to tell us which parts weren't pretty. And then you completed your stay as booked. We understand that our park may not be for everyone; we aren't trying to be a resort. But we offer many amenities (large laundry room, hot tub, heated swimming pool, movie check-out, activities for guests, etc.) that add value for those who appreciate them. Our no-refunds policy is in place for a reason, and is clearly stated multiple times on our website and through the reservation process. Safe travels to you. Peaceful campground, they do not take reservations by phone and require full payment at time of reservations. Paid extra for a deluxe site which was too small for 40' RV, it required pulling in and backing out. It took a great deal of effort to maneuver between 2 large trees on right side (mirrors inches away from tree) telephone pole/power hookup on left and room for slide outs. Very Difficult entering & exiting river to swim or tube/float with downward slope consisting of shells. Saw several people fall & get slightly injured. Did not use their facilities, lighting was good. Staff closed up the office from 12-1 for lunch which is ridiculous. We camped at Pecan Park Riverside RV in a Motorhome. Shuttle service for tubing/floating on river will pick you up at the front of campground and provide transportation back at end of float trip. Hi, JV. Thank you for sharing your experience. Your site was a pull-forward site designed specifically for motorhomes. It will hold a 45-foot rig. I know you requested to be moved, but options were limited and you chose to stay where you were. We normally operate at capacity or just below it, but you can request a specific site number when you reserve in advance for a week or longer. Week-long stays can be booked as much as a year in advance, and our best sites are typically reserved that far out. It is illegal for us to alter the river banks, so we take what nature gives us. The river entrance actually changed tremendously after the 2015 floods, making it easier to access now. Regarding your last comment, we love our office staff and want to take care of them. They work extremely hard at our busy park, so we feel a one-hour lunch break is fair and necessary. Thank you for staying with us and happy trails. Thank you for taking the time to submit a review. We are reviewing the details of your stay with our staff and will update our response as soon as possible. Rate us after a coupon . Our site is a Deluxe site, not sure what makes it deluxe. Sites are on gravel/sand not level. Close by but not on top of each other. We're in a back in under trees can see the river from our site. Some activities like cookouts & breakfast wagon. Indoor pool, playground, dog park. Not sure if I'd return We camped at Pecan Park Riverside RV in a Fifth Wheel. Jane, thank you for your review. Our sites are caliche road base sites and we maintain them regularly. We actually just got another review about how level our sites are! Please speak with our office if you're ever having trouble getting level, and we will help in any way we can. In addition to the different amenities between sites, our sites are priced based on how often they're requested. Our premium sites are most requested, deluxe are next most requested, etc. Happy trails to you. It was our privilege to host you. Safe travels and happy trails! Not sure what I was expecting for the resort-level price. They charge your card for the entire stay when you book it and there is nothing in the reservation process to indicate that you can get a Good Sam discount even though I saw a GS logo on the park office. But otherwise I really can't find anything to complain about. The staff was friendly and helpful. The pads are gravel, but the patio is concrete. It was level side-to-side. The sites seem to vary from tight to roomy. Ours was roomy. Lots of workers and Winter Texans, but everyone was quiet, friendly, and good neighbors. The river is just a short walk down from the park. All the amenities you'd need - dog parks, pool, activity room, propane fill, laundry, showers, cable, etc. I was very impressed by how clean everything was. The laundry and showers were as clean (if not cleaner) than at home. They are still rebuilding portions of the park and facilities from a devastating flood a few years ago, and some of the campground roads need a bit of work. They looked narrow, but we had no trouble negotiating them. Most of the sites on the river side were very shady (it does look like an old pecan orchard), so satellite can be tricky. We found a hole through the trees looking south though. There are sites on the off-river side that have no trees if your satellite can't be moved away from your rig. Campground wifi is outstanding - they have commercial-level service and speed, and don't charge extra for it. Did not try the cable TV. Verizon cell service good. Everything you need in the area - Walmart, grocery, restaurants, etc. Easy access to I-35 for Austin or New Braunfels. We enjoyed our stay and would stay here again. We camped at Pecan Park Riverside RV in a Fifth Wheel. Be careful in the field overlooking the river - there are cockleburrs if you stray from the path. If you're a recycler - check out Green Guys Recycling next to the Walmart on Hwy 80. Access 24/7. Quartermoon (love the username), it's so encouraging when our first-time guests feel comfortable and enjoy their stay. We hope to have you again, as we rebuild and add even more amenities. Narrow roads including exits. Sites are close together with gravel pads. Ours was level. Could not get cable to work. The system require a digital receiver which is included on my TV set-up. We arrived on Sunday and the office closes at 3pm. I called to report the issue and left a voicemail ( it was 3pm). Did get a call, but missed it. There was no voicemail left for me and nobody came by the site. My rating is based upon what I value in an RV park. This place was disappointing and therefore overpriced in my opinion. We will not return. We camped at Pecan Park Riverside RV in a Fifth Wheel. Cameo, we're sorry you had so much trouble with the cable system. We have fiber optic cable--the best we can get for our guests. The downside is that TVs require a QAM tuner to connect. Most TVs are made with them, but RV TVs don't always come with them. Our print-out in the office shows what is needed, and we also explain it to our guests at check-in. If there are still problems, we're always happy to come out to sites and help. We did call you back, and then made a note for our staff to go to your site the following morning. When they arrived, you had already left the park. We wish you all the best. Most RV Parks websites quote rates for daily, weekly and monthly. Their website quotes daily, weekly and extended stays. I found out upon arrival that means you can't get the extended stay rate (monthly) unless you commit to a 6 month or longer stay. They wanted to charge me the weekly rate which would have been over $1200 for a month. I can't comment on the facilities or amenities because I chose not to stay. Just driving in and out, the park looks level and nice, but way over priced for a monthly guest. We camped at Pecan Park Riverside RV in a Motorhome. Greg, we asked the three review sites you posted on to remove your reviews because you weren't ever a customer of ours. But since this review is still up, we want to give our side of the story. First and foremost, no person can walk in and get a long-term stay. We have many families with small children in our park. We protect them by running background checks on all our long-term guests. These checks take 7 days to complete. This is why our website asks everyone to call first regarding long-term stays. If you had called, you also would have been informed that--this time of year--we only provide monthly discounts to those who want to stay for 6 months or more. We are one of the few exceptions on the river who even provide monthly discounts during peak season! It's unfortunate that you've been posting revenge reviews everywhere, but we have a small business we need to keep afloat. All the best to you. Stayed here for a week. The park is awesome and the staff are very helpful. Could not have asked for a better experience. The granddaughter really enjoyed the indoor pool. On two occasions when I asked the staff for recommendations about places to go and good places to eat they were very helpful. We decided to stay out from under the trees so our satellite would work. Didn't really need the satellite as the cable works well. In the summer, you will definitely want to stay under the trees if possible to help with the summer heat. Will definitely stay here again. We camped at Pecan Park Riverside RV in a Motorhome. newmarboy, thank you for staying with us! There is so much to do in our area, so we hope you come to visit with your granddaughter again. Happy trails! Called ahead and left a message for them to call us back. They never returned our call. Decided to take a chance and drive in. There was a truck camper RV Rally going on. went to office and told the lady we just needed a space for one night. Told me it would be $50. She asked me about discounts, but we didn't have any they accepted. Was told about the Texas RV Park Discount Card and she gave me 10% off. Total for stay was $45, which is ore that we would normally pay anywhere, but we were tired. All gravel streets and gravel sites. Our site was fairly level and it was plenty long for our 40' fifth wheel. Park appears clean and is pretty quiet. Good space between camp sites. We camped at Pecan Park Riverside RV in a Fifth Wheel. Hi Digetydog, thank you for visiting us. Safe travels to you! We stayed for 2 months and the rate is based on that plus electric. The staff is very gracious and extremely helpful. The park itself is beautiful and we had a wonderful view of the San Marcos River. We camped at Pecan Park Riverside RV in a Motorhome. There are many sight seeing opportunities in the area. Go to the San Marcos Outlet Malls. Our welcome at this park was friendly and efficient. We thought we had a "riverside" site, but between us and the river was a huge open field in the process of being cleared and graded - perhaps more sites. The heated pool and above ground hot tub are indeed here; but suffer, like the showers and other parts of this park, from age and many years of use. Deferred maintenance is a great description of the shortcomings here. We would not plan to return. We camped at Pecan Park Riverside RV in a Travel Trailer. Vic and Marsha, we appreciate your insight and observations, but there's more to the story you may not be familiar with. We experienced three major floods in less than two years. As the park's new owners, we took complete financial ownership. Our losses were around $700K. We're simply grateful to still have a business! Our business is still thriving because people who know us know we are 100% committed to doing the best job we can for our customers. We thank them for their graciousness and continued loyalty as we continue down a long 5-year flood recovery plan. So to your specific points, we aren't doing deferred maintenance, but flood recovery. You did stay at a riverside site, on the bluff overlooking the river. There will not ever be additional sites added any closer to the river than where you stayed because we will never risk the safety of our customers. What we have gained is a 4.5-acre tract of what will become park-like usable green space. We had reserved two premium pull through sites. They put us in two back in sites. We requested two pull through sites as we had already paid for when reserved. None were available, they put us at two sites that were on different ends of the campground. During the move of our trailers to the sites, we saw a site, one over from mine was empty. Went back to the office and requested that site, it was reserved. After discussing the other sites, suddenly we were informed the site we were now requesting was available due to a cancellation. That was great, but funny thing is, we were told no money back for cancellations, so why would someone cancel? The group in the office was very disfunctional. Also no discounts at all, good sams, nothing. Only campground in the whole trip like that. Not worth $50.00 dollars a night. We camped at Pecan Park Riverside RV in a Travel Trailer. Hi, John. I'm sorry you were not fully satisfied with your stay at Pecan Park. I can understand how the site change would be frustrating, but there are a lot of moving pieces on our end. Our park runs close to full--if not full--every weekend, so we aren't able to guarantee site requests. Our office staff do their best to accommodate any requests (which you experienced due to the cancellation), but they can't always do so. Speaking of cancellations, we do have them, so availability can change not just daily, but hourly. Regarding empty sites you may see around the park, we have guests who keep sites rented on a monthly basis. So even though they may have taken their rig somewhere else temporarily, their site is paid for and reserved. Finally, instead of raising our rates over holidays and peak weekends and then discounting those higher rates like many parks do, we simply do not accept discounts over holidays and peak weekends. I hope this background information is helpful. Normal daily rate $50 is way too high for what you get. Passport America only works weekdays & is still $25 per night. Staff is friendly, but not quite familiar with their sites. It appears they use certain sites for daily raters and better sites for long termers, of which there are many. We were assigned site 330, which she described as a pull thru with open sky to the south for Dish signal. Not a pull thru. A pull into vs. back into. Very narrow, our 40' bus needed some maneuvering to get straight & not damage any of the hookups. And too many trees to get Dish signal. They have indoor pool but the hot tub needs you to jump through hoops to get access-gotta go upstairs & contact staff to get access. They have a small store, DVD's for borrowing, and propane available for delivery to your rig. Just an average RV park with extraordinarily high price. Be prepared to have self-appointed "traffic cops" jumping out waving arms telling you to slow down while driving through park, we got one crazy lady doing that as my wife idled out the driveway at warp-factor zero. We camped at Pecan Park Riverside RV in a Motorhome. rvrat, we appreciate your insight. I (owner Rachael Rowley) spoke with your husband personally in our office as we tried to find you an available site through a Friday night. There were only five unoccupied sites to choose from, so we put you in 330 which has a direct line of sight to the south. The occupants of the site before and after your stay both used their satellite. We've also had longer rigs stay in that site. As far as the hot tub, we do have rules in place to protect our guests and their children. The same applies to drivers through the park. We have many children and pets and the community wants to look after them. Lots of river tubing in the area and some great Mexican food. There is a new park further from town. Brand new, lake views, young trees however and no shade yet. There is a great taco truck a couple of miles up the road in Martingale, at the intersection there across from the gas station. FANTASTIC breakfast tacos. San Marcos has a lot to offer and between two major cities 45 minutes or less away. If you like to shop, check out the Tangers Outlet Mall. If you like the water, go tubing, kayaking, and/or canoeing down the San Marcos River....or check out the park's indoor pool! Lots to do and see in the area especially if you venture to San Antonio for the River Walk and the Alamo. Also Austin for the night life. within an hours drive to San Antonio and Austin. Check out the Salt Lick restaurant in Driftwood. Excellent bbq. There are plenty of restaurants close by, as well as a grocery store. We enjoyed eating at The Root Cellar (good date night!) and Centerpoint Station (burgers, shakes, country store). Downtown San Marcos has interesting shops, and for the more adventuresome, check out nearby Jacob's Well in Wimberley (40 min drive) and Hamilton Pool in Marble Falls (1 hr). New Braunfels is close with plenty to do, including a Camping World for resupplying, and San Antonio is just an hour away. 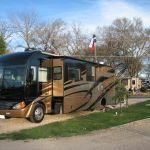 Are you affiliated with Pecan Park Riverside RV ?